The recent announcement of the Bulleen project has received strong feedback from numerous community stakeholders including most recently from the Principal of Alphington Grammar School Dr Vivianne Nikou now in her fifth year of leading the Greek Community’s premier day School. Dr Nikou openly communicated her support and that of the Alphington Grammar School community for the Bulleen project saying this is a project that connects the “Head and the Heart, it’s a project about community, relationships and respect” said Dr Nikou. “Aspiring to Excellence has underpinned all that we do at Alphington Grammar School, and the Greek Community Bulleen Project demonstrates in a practical way their foresight and aspirational thinking which will bring all generations together” said Dr Nikou. 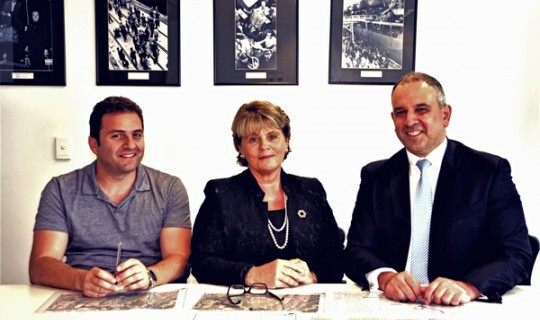 “The multi facet aspects of the Bulleen Project will enable us honour and pay respect to those who have gone before us, we will be able to live our Hellenic values and teach generations of young people that they have a responsibility and now have the forum to see further and do more by standing on the shoulders of giants”. “It’s a bold project with vision” said Dr Nikou. “We are now seeing third and fourth generation Greek Australian descendants with increasing numbers of mixed marriages as well as many different cultures choosing an Alphington education because of its multicultural inclusive nature. The Bulleen Project will give the whole community access to facilities including the concept of a Sports Excellence Centre with multiple indoor and outdoor facilities. The new vision would see soccer and athletics facilities amongst other sports with access to experienced and successful elite and high performance coaches who will focus on strengthening, conditioning, nutrition, recovery and technical proficiency aspects of the sports program the school cannot deliver on at present. Like most strong Independent Schools, the redevelopment of the Bulleen property would enable educational priorities to sit front and centre with an environmental and cultural awareness centre, respect the wetlands and be sensitive to indigenous priorities, alongside bike education, bike tracks leading into the CBD and all the leisure and recreational facilities envisaged”. “Given the number and growth of language classes across the Community School campuses, the Bulleen Project will allow for consolidation and the ability to access our own auditorium facilities showcasing theatre and musical performances in purpose built centres” added the Chairman of Alphington Grammar School, Mr Nick Koukouvitakis. Member of School Council Dr Marinis Pirpiris also highlighted the strength of the vision for a premier Aged Care Facility “where Grandparents and the elderly can access the envisaged venues to watch their Grandchildren play, train, compete and perform adding much to the health, wellbeing and dignity of how we treat our elderly”. “The way to engage our young and teach them our values, pass on traditions and keep our culture alive is through investment and funding in such significant and educational projects” said Dr Nikou. “I congratulate the members of the Greek Community on such an exciting and far reaching project”.